You are currently browsing the archives for the Margaret Anderson-Kelliher category. In a surprise move, the DFL has opted to hold an endorsing convention to fill the soon-to-be empty seat left by Keith Ellison’s decision to run for Attorney General. This should get interesting. First, most of these candidates are socialists. Putting them on display will only remind Minnesotans how far left the DFL has drifted. Despite all of the names on the ballot, this is essentially a 2-person race between Ilhan Omar and Margaret Anderson-Kelliher. Based on what I’ve seen thus far this election season, I’d consider Omar to be the frontrunner for the endorsement. I don’t know that there is a frontrunner in the primary. It will be interesting to see which part of the DFL is dominant. I suspect it’s the Ellison-Omar wing. MnSCU commissioned Minneapolis PR firm PadillaCRT to help it “communicate the collective value” of the 31 colleges and universities it oversees throughout the state, according to a report the company delivered Tuesday. Most troubling, the report suggests, is that the current branding is merely a “generic description” that “communicates very little” and doesn’t do anything to clarify exactly what the system is and which colleges it includes. Connections are to individual schools. Students and alumni think of their alma mater. Business and community leaders have local or regional perspective. School leaders need autonomy to serve their communities. Rarely does anyone think of MnSCU in the aggregate. Even among those most familiar with MnSCU, people do not think of it as the sum of its parts. I wish I could say that I’m surprised but I can’t. 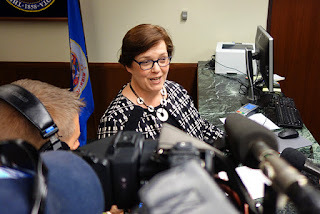 Margaret Anderson-Kelliher attempted to shove a major spending increase down Minnesotans’ throats when she was Speaker of the Minnesota House of Representatives in 2007-2010. Earl Potter in running St. Cloud State into the ground financially as we speak. Of course, they’d team to spend the taxpayers’ money foolishly on a report like this. It’s part of who they are. They can’t help themselves. A ton of research highlighted Charting the Future’s deceptions. CtF isn’t Chancellor Rosenstone’s vision for MnSCU. It’s a collaboration of major corporations through the Minnesota Business Partnership, a powerful trade organization (MHTA), a Minnesota-based consulting firm (McKinsey & Co.) and a well-connected former Minnesota politician (Margaret Anderson-Kelliher). Mostly, it’s the work of McKinsey & Company under the title of the Itasca Project. First, government bureaucracies don’t “form new collaborations” to “optimize system-wide intellectual assets and efficiency.” It’d be great if they did but bureaucracies don’t do those things unless they’re forced by the changing of state statutes. In the past decade, MnSCU has spent money by the tens of millions on IT consultants that claimed they would create efficiencies that would result in efficiencies for students — student tuitions still continued to skyrocket. The only savings we have seen for students in recent years came from the legislative buy down of tuition rates. When lobbyists, corporations and consultants put a plan together, nothing good will come of it. According to this webpage, Margaret Anderson Kelliher is the president & CEO of the Minnesota High Tech Association, aka the MHTA. She’s also the vice-chair of the MnSCU Board of Trustees Executive Committee. In other words, McKinsey wasn’t hired by MnSCU to implement CtF. They were hired by MnSCU to create, then implement, CtF. That’s definitely a significant deception. I didn’t have high hopes for CtF prior to this research. I have less faith in it after doing the research. While Duluth and other media speculated that opponents and supporters were evenly split at the five-hour public hearing that included a two-hour open house session and a three-hour comment period, the numbers just don’t add up that way. They reported that attendance was 1,300 to 1,500. But of that number, a caravan of seven buses and a passenger van journeyed from the Range with at least 500 supporters and another 100 or more arrived in advance by cars. Simply put, there are lots of Iron Rangers who badly want PolyMet to happen. They might not have sophisticated presentations but what they lack in sophistication, they more than make up for in passion and verifiable information. The unified message of business and labor all across the Iron Range to Duluth and the Twin Cities delivered in a fact-based and civil manner was outstanding. Yes, some opponents and preservation groups will continue their misinformation campaigns which are part of an excessive rhetoric fear campaign of damage to the environment. The facts, however, will win out in the EIS and then permitting processes. And the preservationist fear mongers do not hold those cards. The list of four is heavily female-metrocentric-weighted. The governor’s chief of staff, Tina Smith, state Sen. Katie Sieben and Kelliher, all of the Twin Cities area, are strongly suggested. The other person that’s supposedly on Gov. Dayton’s short list is IRRRB Commissioner Tony Sertich. I haven’t confirmed whether Sertich is actually on Gov. Dayton’s short of if he’s more of a ‘wishful thinking’ candidate. Still, the risks are high for Gov. Dayton. If he picks a Metrocrat, he risks alienating Iron Rangers. If Gov. Dayton picks Sertich, he’s essentially snubbing the check-writing, anti-mining Metrocrats from the Twin Cities. The other name I’ve heard floated is former Sen. Tarryl Clark, aka Taxin’ Tarryl Clark. With Gov. Dayton’s tax increases likely to be a major campaign issue, Taxin’ Tarryl would just add fuel to that fire. That’s before talking about her responsibilities with the Blue-Green Alliance. ‘Carpetbagger’ Tarryl didn’t win many friends when she ran for the Eighth District endorsement. DFL activists rejected her, in part because she was a carpetbagger, partially because she’s as anti-mining as the Metrocrats on that short list. The simple truth is that Gov. Dayton will have to choose. Either Gov. Dayton sides with the elitist Metrocrats and alienates Iron Range Democrats or he sides with the more conservative Iron Democrats and alienates elitist, anti-mining Metrocrats. There’s an old, ancient really, joke about giving a chameleon a nervous breakdown. The way to give a chameleon a nervous breakdown is to put it against a plaid background. In this situation, I’d argue that Gov. Dayton is the chameleon and the DFL is the plaid background. How the mighty have fallen. Paul Wellstone and Hubert Humphrey were great debaters. By comparison, Carrie Lucking, Denise Cardinal and Javier Morillo-Alicea are best known for their name-calling, not for fidelity to the truth. Shift school aid payments from 70/30 to 60/40 for $700 million. Increase per-student aid to cover borrowing costs. Issue appropriation bonds to cover the remaining gap, if any gap remains, between the Governor, Speaker and Majority Leader. 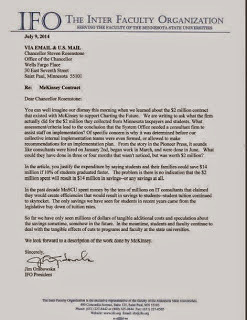 Add $10 million to University of Minnesota funding. Special session: lights-on thru July 11. Return to pass budget bills on July 11. Notice that last line. The GOP and Gov. Dayton agreed to a special session to pass a lights-on funding bill that would’ve kept funding government through July 11. Further, they agreed to finish negotiations, then pass the budget bills funding government for the rest of the biennium. Gov. Dayton initially accepted that offer, then broke his promise. Note that this was the second time Gov. Dayton reached agreement with the GOP legislature on the budget, then slithered away from their agreement at the insistence of Rep. Thissen and Sen. Bakk. Another of this ad’s claims is that the GOP insisted on preserving tax cuts for the wealthy. Here’s another dose of reality. The tax rates haven’t changed since Jesse Ventura was governor. That means the Margaret Anderson-Kelliher-Larry Pogemiller led legislature kept the tax rates for the wealthy in place. Net non-dedicated general fund revenues totaled $3.750 billion during the first quarter of fiscal 2013, $145 million (4.0 percent) more than projected in February. Each of the major taxes showed a positive variance for the quarter. Individual income tax receipts exceeded forecast by 2.2 percent, sales tax receipts were up 1.7 percent and corporate tax revenues were 15.3 percent more than anticipated in February. Government revenues don’t rise when people aren’t working. The fact that non-dedicated revenues rose by 4% during Q1 indicates that jobs are being created. In fact, it suggests that lots of jobs were created under the GOP’s stewarship. The truth is that progressives’ attacks on GOP legislators are mythical, not reality. They’ve accused GOP legislators of shutting down government. Documents prove that Gov. Dayton shut government down. Progressives accuse GOP legislators like King Banaian of voting against job creation. Official reports prove that jobs are being created at a fairly brisk pace, which is leading to increased revenues. Progressives insisted that it wasn’t possible to balance the budget without creating one of the highest income tax rates in the nation. The GOP refused to create that highest-in-the-nation tax rate. Revenues are up 4%. If I didn’t know better, I’d think that doing the opposite of what progressives are demanding is a pretty smart idea. Continuing his strong commitment to job creation and economic prosperity, Governor Dayton is traveling statewide to identify opportunities and barriers to economic growth in key sectors of Minnesota’s economy. The Governor is meeting directly with business owners, workers, and local leaders to seek input on what measures should be taken in the upcoming legislative session to enhance Minnesota’s economic competitiveness, stimulate private sector job growth, and open new doors of employment opportunity for Minnesota workers. First, if Gov. Dayton wants to create high paying mining jobs, his time would be better spent lobbying his ex-wife to call off her war against mining. She’s made it perfectly clear that she doesn’t want to see a robust mining industry in Minnesota. Taxes remain a key obstacle to job creation, identified by seven out of 10 employers as one of the two most important barriers in Minnesota. The tax burden continues to grow compared with five years ago. The stability and predictability of government regulations are important factors in business decisions to invest in Minnesota operations. Gov. Dayton still wants to create a fourth income tax bracket, which would make Minnesota one of the highest income tax rates in the nation. The campaign includes the web site MiningTruth.org, a 40-page report examining mining in detail, a Facebook community, and four billboards along Interstate 35 between the Twin Cities and Duluth to reach summer travelers. While Gov. Dayton poses for photos with DFL candidates pledging their unswerving loyalty to the mining industry, the mining industry isn’t what’s holding up high paying mining jobs. What’s standing in the way of mining jobs are DFL heavyweights like Alida Messinger, former speakers Dee Long and Margaret Anderson-Kelliher, former Senate Majority Leader Dean Johnson, former MPCA Commissioner Paul Aasen, and RINOs Arne Carlson, Dave Durenberger and Jim Ramstad. Gov. Dayton’s taxation and regulatory policies create uncertain, which hinders job creation. That’s what the Minnesota Chamber of Commerce members said in their annual survey. Rather than spending time taking photos, Gov. Dayton should spend his time figuring out how to clean up what’s wrong with St. Paul.